Colt's memory is returning after the accident that ended his career. Now he wants to take over his family's inn, but he'll have to partner with his former fiancée to be able to afford it. He'll need forgiveness to make that happen. Tia's goal is clear: to return the inn to its former grandeur. And she'll even work with Colt to do so. But like the inn, their relationship needs a lot of work. He broke her heart...can she ever trust him again? Colton Reece propped his weathered boot on the gray boulder marking the driveway. This was the place. He shut his eyes, feeling the warm breeze flick the ends of his hair, and drew a breath deep enough to drag in the smell of the flowers growing around the rock, whatever they were called. It was just as his grandmother had told him. He’d been here before. He looked around, lowering his gaze to the uncut lawn surrounding the inn. An uneven carpet, the bald, earthy patches emphasized why he was here. This grass could be brought back with a little care. This was land he needed to own, land that needed him. And thanks to God’s grace, now he could remember. Eyeing the auction sign swaying with the wind, Colt straightened, stretching. Getting this place back in shape wouldn’t be easy, but the lack of prospective bidders standing on the lawn was a good sign so far. Turning them away wouldn’t be pleasant, but there was no need for an auction now that he was back. To think he’d nearly missed today, nearly let the place slip from him, to go to the highest bidder with a cold cash deposit. Colt rubbed his jaw, his fingers pushing his taut cheeks in circles, striving to ease the tension. He needed to walk. Circling the property, he took note of the outbuildings that needed repair. He could manage most of it himself. The house looked sturdy, although the white wooden planks covering the wings of the sprawling rancher badly needed paint. Lining the back and sides of the house was a wooden deck in need of bracing and refinishing. He couldn’t see the pool, but knew it was in the center of the wings, surrounded by the house itself, and Colt didn’t have a key. Too bad. Being in possession of the keys might have helped him call the auction to a halt. Hidden behind the house sat the lake, and Colt stiffened at the sight of the calm, glassy water. Not that he’d forgotten about it. He never would. The lake still gave him a creepy feeling, despite the eighty-degree temperature of the June morning. Without boats, rafts, or swimmers taking advantage of its cold depths, the lake looked like nothing more than a pond. Even the pier seemed rickety, splintered, and uncared for as it jutted from the shore. It wouldn’t support the weight of a small child in that condition or keep a small boat steady. But that wasn’t Colt’s fault. 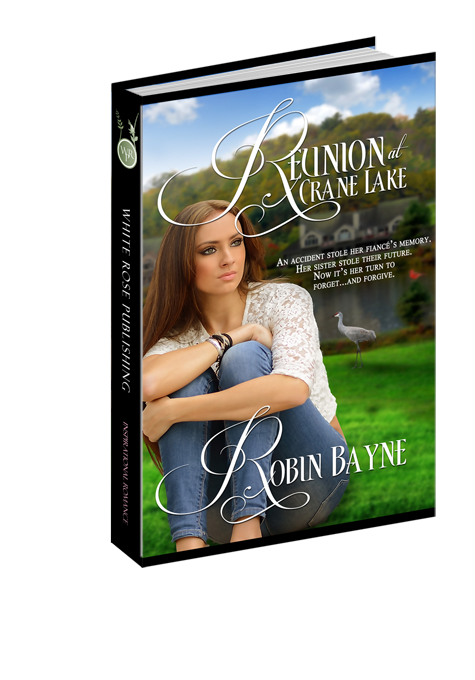 Shaking off the icy hand that pinched the corner of his mind, he put the lake behind him and circled around the inn. By the road and circular driveway, Colt examined the elaborate, sculpted sign that announced the inn’s unique name: The Crane and Cardinal Inn. An artist’s rendition graced the top of the post, a large crane that had originally cradled a now missing red bird created from something like brass and pink marble. He waited by the sign, leaning, nodding to the auctioneer arriving in a dark sedan. Colt had met him a few days prior, asking the man a multitude of questions about the auction process, about what would happen should he decide to claim his heritage as Gran had wanted. He’d asked about canceling the auction, making sure the real estate guru understood he’d be paid either way. John Berger had frowned and asked for proof that Colt had regained his faculties. As if he’d lost his mind instead of his memory. The short man emerged from the car and the agent slam the door so hard his one strand of slicked hair slid across his huge forehead. He clutched papers in one hand. Two more cars entered the drive, slowing to a stop behind the sedan. Colt swiped a hand across his mouth, tasting metal and dirty wood he must have picked up from the inn’s flaking sign. More cars meant more bidders to turn away. Once he owned the place, he’d put up a new, tasteful sign. Maybe it would say “Reece’s Retreat.” He smiled at the corny idea. “You look happy, Mr. Reece,” John Berger said. “Can I assume you’ve decided to keep the place, as your grandmother requested?” Two car doors closed, and several people in suits descended on the property. “And the inheritance taxes, yes, I am aware.” Colt sighed, rubbing his jaw again. Stress always lurked in his facial muscles. Gran always said he’d get wrinkles early on. He was sure Gran hadn’t been aware of how much she owed. She probably never dreamed how much money it would take for her grandson to keep the inn. But he could probably get a loan. Maybe. “Well, in that case, I’ll inform the others that the sale has been postponed.” Berger shoved a stack of papers into his briefcase, his face reddening in agitation. The skin on his neck prickled, and not from his untrimmed hair. He knew that voice. At least, he knew it now. Turning, he eyed the woman, taking in her stylish black suit with the slim skirt and sensible flats. Her long, reddish-brown hair was pulled into a ponytail, hooked into one of those clamp things women used. She returned her attention to Berger. Snorting softly under his breath, Colt moved back and leaned against the sign, grasping the pole for support this time, feeling it give slightly with his weight. Under his palm, splintered flecks of paint scuffed his skin, yet his gaze never wandered from the woman. How could she be here now? Why? Was it some sort of sick revenge? Had he sinned so much? Must have been the sun getting stronger, for Colt felt himself start to sweat when Berger and the woman moved closer to him, still talking steadily in whispers. The other men had already piled back into their car and were pulling out onto the narrow, country road. “I think we have a solution, here, Mr. Reece, if you’re willing to listen with an open mind.” Berger took a handkerchief from his breast pocket and swiped his mile-wide forehead. Open mind? Colt’s gut clenched, but he waited, listening to whatever she had to say. Whatever they had to say. He met her gaze then, staring into her intense, ebony eyes. They looked almost Asian to him, narrow at the edges. He used to love those eyes, kissed the eyelids all the time. And he remembered doing it. But that was an awfully long time ago. Watching her, Colt couldn’t help but remember another time, when she’d stood by him, offering her home for his rehab time. She’d wanted to stand by him when he had no idea who she was. She’d looked like this then, her dark eyes focused on his, one hand pushing her hair away from her face as she told the discharge nurse she’d see him home. “Well?” he asked, when no words came. “Because I want to be half-owner.” She spoke again, as if he’d not addressed the question to someone else. “I also have the money to help with the renovations, along with some willing elbow power.” With that she slipped out of her jacket, revealing a prim and proper sleeveless white blouse and well-toned arms. Colt watched her watching him. He could remember when her gaze had been filled with warmth for him. She seemed to be breathing a little more rapidly now that her agenda was on the table. Berger nodded once, firmly. “I’ll leave you two to discuss things. Call me.” Halfway to his car, he turned to Colt. “If you can get past the, um, personal issues, I’m sure you’ll see that this is the best solution all around.” He slid into his real-estate-agent car and left. Colt was left standing face-to-face with the woman he’d once forgotten.